Oh my goodness!!!! Half the year is already over ? How is that even possible?! Every year seems to go by quicker and quicker. This year is no exception! This quarter was BUSY for me. We moved last week (yay!!!) and well June was pretty much a wash for reading, I did manage to read some but didn’t meet all my goals. Oh well, there’s always next quarter right?! Read on to see how I did in each of my year-long challenges. For this challenge, you create a list of books that you commit to read throughout the year. You determine the number of books you will read per month and choose books from your list to read. It is hosted by Berls @ Fantasy is more fun and Michelle @ Because Reading. You can sign up anytime, but can only start the challenge for the month after you sign up (ex. if you sign up in Feb, you cannot count books read in January). This challenge is all about the new books of the year and of course reading them 😀 It is hosted by Stormi @ Books, Movies, Reviews. Oh My! and Lexxie @ (un)Conventional Bookviews. This challenge is for people like me, who have been blogging a while or life got busy and books got forgotten. I fall in the later. 2015 was not a good year for us and everything suffered. I’m ashamed to say that I have roughly 45 ARCs on my Kindle and another 3 or 4 hardcopies lying around to be read. Now not all of those qualify for this challenge, but several do. This challenge is hosted by herding cats & burning soup and Addicted to Happily Ever After. Join me by signing up here and follow my progress on Goodreads or below. I think I may be the most excited about this challenge hosted by Tracy @ Cornerfolds and Claudia @ My Soul Called Life. It is NO secret that I LOVE dystopians. It’s a majority of what I read each year. So this challenge is right up my alley! There are four levels to choose from on this challenge and I’m going ALL IN! 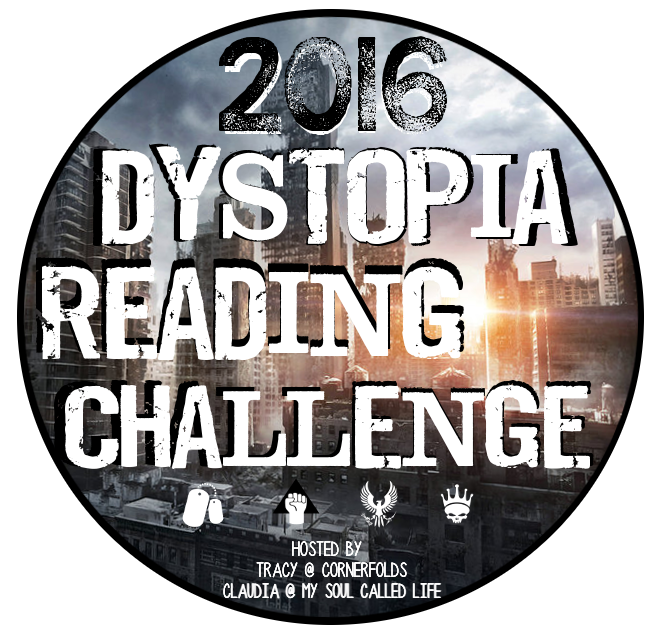 Read and review 16+ dystopian books. To join me on this challenge, sign up here and follow my progress on Goodreads or below. Your turn! How are you doing with your reading challenges?